Romance still clings to some of the old streets of London, and just behind Tottenham Court Road, in the dingy quarter of Charlotte Street where Rosetti and his confrères spent many happy hours, [stands Haarnack's] queer old-fashioned shop where harps of all descriptions are sold and very often repaired and restrung. Mr. Haarnack...is still full of enthusiasm for the work. A wonderful old man with benevolent blue eyes and white hair, he recounted to me yesterday with a good deal of pride how the greatest harpists of the day would visit his shop to have their instruments repaired and talk with its owner. (1) The Sunday Province, Vancouver, British Columbia, October 3rd, 1926. (2) The Sunday News, March 7th 1926. (3) South Wales News, Thursday March 11th 1926. Henry David Haarnack was my great-great-grandfather. In 1926 he still had the ledger used by his grandfather. Forty years later, and forty years ago now, in the 1960s, my father was prompted to do a bit of detective work after reading a newspaper article about the Morley family and their connection with the Erards. He remembers receiving a delightful letter informing him that some of the Haarnack ledgers still existed. I cannot think for the life of me why, after going to all this trouble, my father never replied or followed this up, but he didn't! And now his memory is failing him! He has lost the record of this correspondence and he does not know the name gentleman who wrote to him, but he believes he was related to a famous general. I think the chances of finding that those ledgers have survived is very slim, but stranger things have happened, so perhaps one day they will come to light again. I have, however, been able to piece together some information on my family's harpmakers, some from oral tradition, and some from newspaper accounts. 1. In 1786 Erard opened its first London showroom, and Christian was twelve years of age. Perhaps he went there then as an apprentice. 2. Some of my family believe that he was making harps in London before Erard, and might have been recruited after Erard lost his Paris company to the 1796 Revolution's destruction and began manufacturing pianos and harps in London. Maybe, therefore, he joined Erard as a fully fledged master craftsman. 3. Wherever he worked, it would first have been on harps with the single-action fourchette (forked-disc mechanism) or the crochet and bequille like those by Nadermann and Cousineau [see also "The Louis XVI Harp" by Beat Wolf]. He was 20 when Erard took out his first patent in 1794 for improvements to the harp, and I like to think that in the following years he might have worked alongside Sebastian Erard during the latter's most productive and creative period. I continue to look for information on Christian and his forebears. Is Haarnack perhaps German or Danish or Dutch? Does his name appear on harps or records of employment, on a bill, invoice or order? Who were his parents, and what business was his father in? I will treasure each small detail as it comes my way. 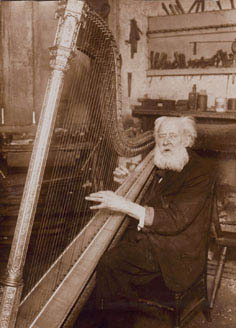 Henry was Christian's eldest son, and followed him into the harp making business, setting up a Haarnack shop. 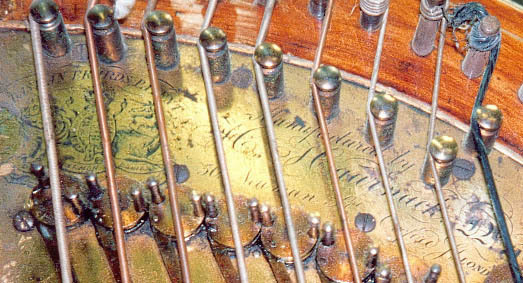 The earliest record we have of a harp bearing the Haarnack name dates from 1833. Soon afterwards, their harps began to appear which also had the inscription "as in the Erard patent". It is likely they were built in the mews between 25, Newman Street (near Henry's house at #50, opposite the Middlesex Hospital) and a Berners Street address. By the time of the census in 1881 old Henry Haarnack was semi-retired. His sons Henry David and George Christian were working as harp makers whilst he was the proprietor of the coffee shop next door. No doubt he went in there to offer advice and help when they were busy! Henry and George Haarnack in their shop, 1926. As you saw in the newspaper accounts which open this article, Henry David was my great-great grandfather; George Christian was his brother, though they were about 18 years apart in age. They both worked at the shop. Henry David had two sons, Henry, aka Harry, (1862-1924) and George Willoughby (1867-1930). 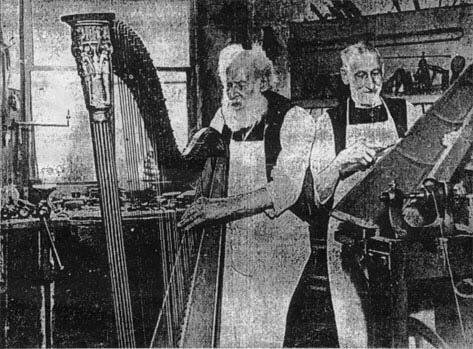 Neither was a harp maker, though both were musicians, but George sometimes helped out at the shop. In her autobiography, "Life on a Harpstring", Marie Goossens (1894-1991) describes going into the Charlotte Street shop and meeting [what she thought were] three generations of Haarnacks. "There was still another firm in Charlotte Street, W. 1 which was called Haarnack. I think they must have repaired harps because there was nothing to see but pieces of wood and bits and pieces, more of a joiner's shop than anything else. I had a query and I put it to the young man who attended me, but found he had to ask father. Out came father - quite a Victorian picture - a slim grey-bearded man, very trim in a black frock coat, ready to receive the customers. Well, the impossible happened, he could not help me so he said, "I'll go and ask Father". This was like a dream. Out came the first generation...the worker...he looked like Falstaff or Father Christmas appearing in the background. A big man with snow-white hair and beard, his shirt sleeves rolled up and a carpenter's apron around him. He was the one who could help me." Let's put Marie in the shop in 1914, when she was 20. At that time, George Willoughby, the musician who sometimes helped out, was 47. His uncle, George Christian, was 61, and his father, Henry David, 18 years older, was 79. Depending on how young George W. looked, pehaps he and uncle appeared to be father and son. Certainly H. D. and his younger brother could have appeared so. Surely the true grandfather, Henry, couldn't have been there when Marie was: he died four years before her birth! And George Willoughby had no sons, nor did Harry, to whom H.D. would have been grandfather. 1. Why did Henry David say to the newspaper that there had been four generations at the trade in our family? I see only three, as the last Henry and George were not craftsmen, but performing musicians. 2. Could it be that the first Christian's father also was a harpmaker, making the fourth generation? 3. Were there in truth a son, father, and grandfather in the shop the day Marie Goossens visited, and who were they? Grandad's business had never been a very large enterprise like Morley's or Erards, but over three generations they had built up a good reputation and they had many loyal and famous clients. Amongst these were John Thomas and Balsar Chatterton, court harpists, and the Goossen sisters, Marie and Sidonie [101 years old in 2001] . By the 1920s everything had become run down and the brothers were beginning to run out of steam. They no longer made harps, and did more repairs than anything. No one was prepared to learn the master craftsman's art so, when Henry David and George Christian decided to retire and close the shop, it marked the end of an era. Henry David died a year later. George Christian outlived both his nephews and was the last to bear the Haarnack name. Also of interest: Until 1935, the Randolph Wurlitzer Company made first an automatic harp, then several models of pedal harp.